The Senate confirmed Keith Harper as ambassador to the United Nations Human Rights Council Tuesday, making him thefirst Native American to ever become a U.S. ambassador. A member of the Cherokee Nation, Harper helped represent around500,000 Native Americans who brought a class-action suit — Cobell v. Salazar — against the United States in the 1990s over alleged federal mismanagement of revenue from mines and oil wells owned by Native Americans. Senate Republicans objected to his confirmation due to his involvement in the Cobell case and his role as a bundler for Obama’s campaign. “Mr. Harper is just another example of a campaign bundler wholly ill-suited to serve in the diplomatic post for which he’s been nominated,” Sen. John McCain (R-Ariz.)said Monday. McCain argued that Harper and his colleagues had taken an inappropriately large cut of the settlement in the case in the form of attorneys’ fees. He also questioned whether Harper was involved in the distribution of an email to his Cobell clients listing thepersonal information of four individuals who had appealed the settlement, concerned that it could be harassment. 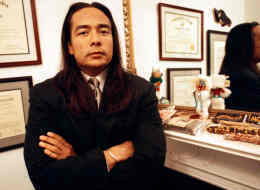 The Indian Country Today Media Network also reportedthat some Native American lawyers had alleged that Harper used intimidation tactics against other attorneys during the case. “People like Mr. Harper can’t be a party or complicit with a letter attempting to harass Native Americans for exercising their rights, and then expect to obtain the Senate’s imprimatur to serve as our nation’s ambassador on human rights,” McCain said. Harper’s confirmation was approved by a party-line vote of 52-42 and was hailed by Native American groups as a positive step forward. “Keith’s confirmation is of great accomplishment for all of Indian Country,” said Navajo Nation President Ben Shelly in a statement. One group, the National Congress of American Indians, also called for more nominees to federal posts in the wake of Harper’s confirmation.